It’s only two years since Ade bought a ‘Brown Turkey’ fig tree for our back garden. I was a little concerned at the time as the number of trees he was buying seemed rather ridiculous for our tiny little garden. You know as well as I do, saplings don’t remain saplings for very long. 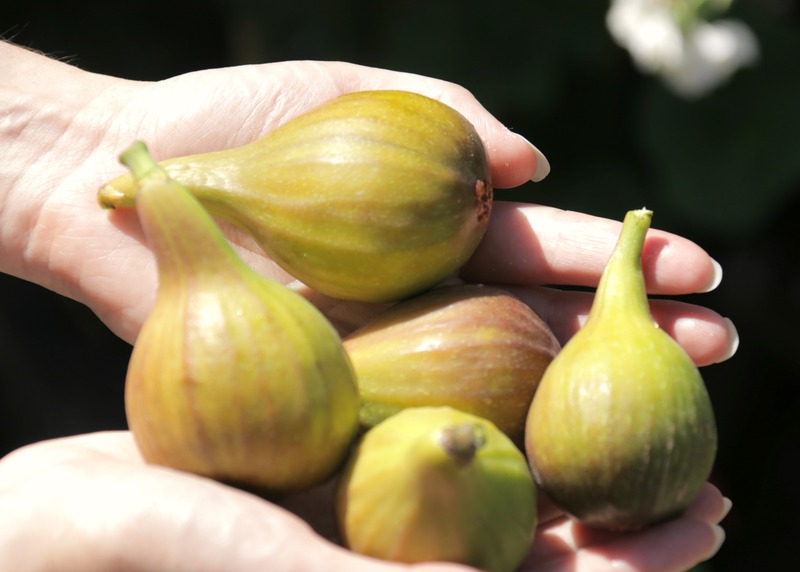 But he found a space for it, and planted it, and last year it gave us a handful of delicious figs. This year, however, it is LADEN with fruit! Sweet, juicy and ripe, they taste amazing; I’m so happy he bought that tree! I didn’t even think figs could grow in this country, but they do quite happily, and this recent heatwave has resulted in a bumper crop. They’re best picked straight from the tree and eaten still warm from the sun, but Ade loves them with Greek yoghurt and a spoonful of honey for breakfast. There’s something a little bit special about figs. Maybe it’s because at this point in the summer, it’s all about the berries, so it’s exciting to have a fruit ready for eating that feels a little more substantial. After all, we still have to wait a while for the plums, apples and pears to ripen. Or maybe there is something magical about them. Figs are an ancient fruit, widely referred to in classical texts. They were studied by Aristotle and mentioned in the Quran. Adam and Eve purportedly dressed themselves in their leaves, and Buddha achieved enlightenment under their tree. From a nutrition point of view, they’re certainly pretty special. 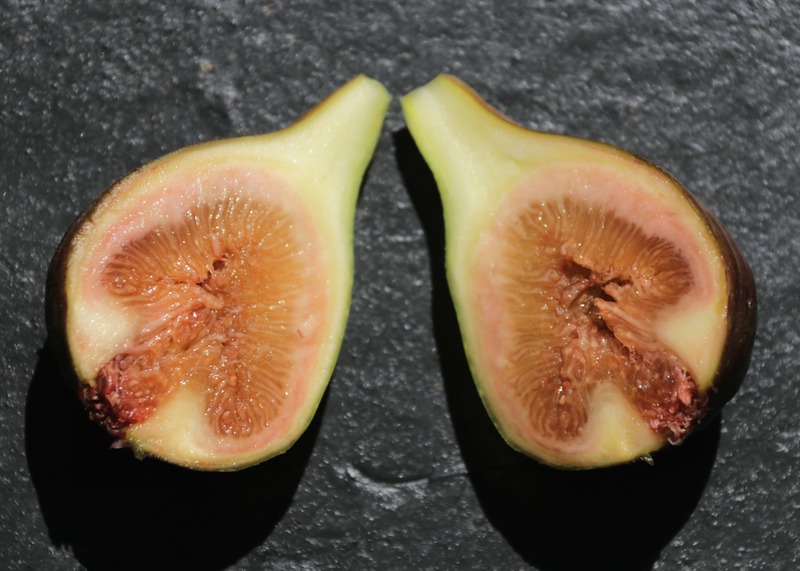 High in potassium, calcium, iron and a whole host of other minerals, figs are health-boosting powerhouse. And, as we’ve discovered, they’re super-easy to grow, which is good news as they cost a fortune at the supermarket. So I’ll just keep schtum the next time Ade comes home with something that I think we’ve no room for. The lad clearly knows what he’s doing. There are about fourteen small fig trees on one of my garden parcel. They are just there to provide cuttings for more trees. They are not allowed to grow into fruiting trees. There is not enough space for them all. Even if fig trees are kept small, just a few trees are too many. When I lived in town, there was only one mid sized fig tree that was more than sufficient! Oh, my gosh! I am so very envious. Those figs look utterly delicious. Absolutely fabulous. I really don’t think I have room for a fig tree but agree it is great to get a crop which is expensive in the shops. I think apples will be early this year. Don’t be too quick to dismiss getting a fig tree, Helen, I didn’t think we had room in our tiny garden either! But it’s actually a very small tree (you can grow our variety ‘Brown Turkey’ in a container) and it’s incredibly productive as we’re finding out! Okay, I’ll think about this then. Thanks!